This is the first full week of the new year and I have been so excited to knock the dust off this blog and get involved again. The month of December didn't go exactly as planned - sickness, hospital stays and unplanned surgeries rocked our house, on top of the holidays. To say we are glad to yell goodbye to 2014 is an understatement! We made a lot of great memories in 2014 but it was a very stressful year as well. Time to start fresh and get control of our life and house again. One thing that we use to do all the time was meal plan. Over the past few months, I simple got out of the habit of meal planning and going grocery shopping on Sundays in general. During the week we would race around after work trying to figure out what we were having for dinner. It made our work weeks stressful and hectic. My husband hated the 3:20pm text that only said "Dinner?". It wasn't working. 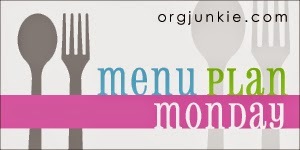 One of the greatest things we are bringing back in 2015 is Menu Plan Monday!